Heat oil in a pan, add chopped onions, crushed ginger and garlic and saute well. Add chopped tomato and green chillies and saute till soft. Add chilli powder, coriander powder, fennel powder and salt and stir well. Add one cup of water, mix well and cook covered for few minutes. Uncover the pan and then add coconut milk and stir well. When the gravy begins to boil, gently put in the egg pieces and boil for 1-2 minutes. Fingerlicking good egg curry. Always love coconut flavor. 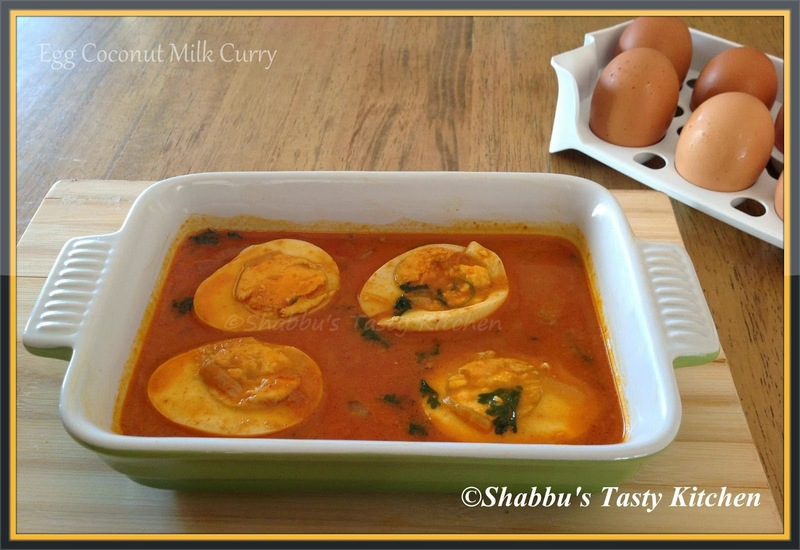 Egg curry looks delicious. Shabbu I always love your presentation.